Although riding a motorbike can be an exhilarating experience, it is also true that motorcyclists are much more vulnerable to accidents and injuries than other road users. According to data published by the Department for Transport, motorcylists in the United Kingdom are up to sixteen times more likely to be involved in a serious road accident than car drivers or cyclists. In 2011, there were nearly 400 fatalities involving motorcycle drivers and / or their passengers in the British roads. Although this figure is 10 per cent lower than in previous years, motorcyclists remain highly exposed to the dangers of the road and need to ensure that they take all the necessary precautions to minimise the potential risks. Wearing adequate protective gear is one of the most important things that motorbike drivers can do in order to improve their overall safety while on the roads. Below you will find a detailed guide to motorcycle safety wear. In addition to making sure that helmets have a high SHARP rating, motorcycle riders must ensure that their helmets are built in compliance with the standards set out by European Regulation 22.5 and/or by British Standard 6658: 1985. Helmets should be fitted with a label stating their compliance with these standards or carry the BSI kitemark. Helmets must have other safety features in addition to their outer shell. The helmet's visor and goggles must also be built according to the industry standards mentioned above, and must be labelled accordingly. Tinted visors can only be legally worn during daylight hours, as long as the tint does not exceed 50 per cent. Motorcycle helmets are affected by wear and tear, so they must be replaced every 3 to 5 years, depending on how often they are used. Safety helmets can be classified into different types according to their design and the level of protection that they offer. 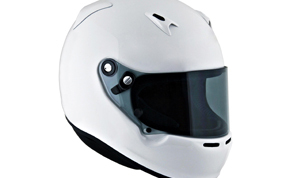 Full face helmets offer the maximum protection, as they cover the whole head (including the jaw and the neck), leaving only an opening around the eye port. Three quarter helmets protect the head and neck of the rider, but leave the face exposed. In most cases, three quarter helmets come fitted with an adjustable shield that covers the eyes. While they are lighter than full face helmets, the level of protection offered is not as high. Modular helmets are built combining the best features of full face and three quarter helmets. They are lightweight and aerodynamic, but they offer full face protection thanks to a flip down face guard. - stitched and bonded soles offer the maximum level of foot protection. Sole ridges should be at least 4mm thick. - boots should be both flexible and sturdy, so it is wise to choose motorcycle boots made of leather that are at least 2.5mm thick. Good-quality motorcycle gloves can protect wrists and fingers from serious injury should an accident occur. Although gloves should be thick enough to provide protection against the elements, they should allow full movement too. It is a good idea to choose motorcycle gloves that cover the wrist area fully, that feature knuckle protection, and that are waterproof to some extent. To increase safety, gloves should be stitched and reinforced, as well as built in layers all around the palm area. It is also important to check that the materials with which the gloves have been made offer thermal comfort and keep your hands dry and warm. Recommended materials include GoreTex, Kevlar, and Cordura.